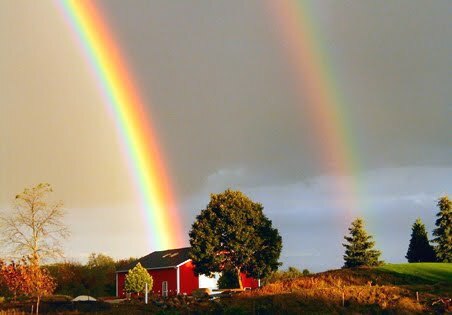 I'm in the mood for rainbows today, so I have several wonderful pics, some real some created, to share with you. Because rainbows are beautiful to look at and generally make me feel happy, so I'm sharing the feeling. 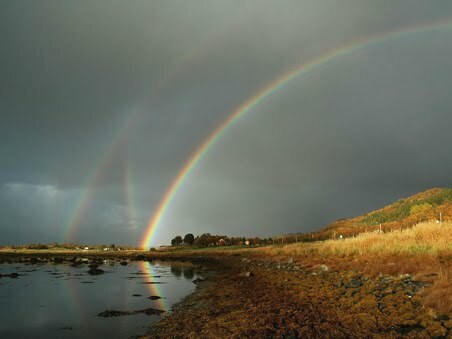 This triple rainbow was in Norway. Pretty neat, isn't it? It's my day off today. I wanted to take the time and go see Titanic in 3D, but I can't spare more than three hours of time in my day, so I will have to wait. I have writing to edit - both for my friend in Germany as well as for myself, and I have been working through a Life Drawing course that I would like to set up my easel and play with some more. I'll phone my friend in California late in the day, and do laundry. I need a new skirt, maybe I'll spend a short time shopping. All told, I think it will be a fun day and maybe ... just maybe ... I'll get some housecleaning done also. I'm optimistic about today, at least right now. So, I'm sharing pretty pics because sharing the joy is always a positive thing. 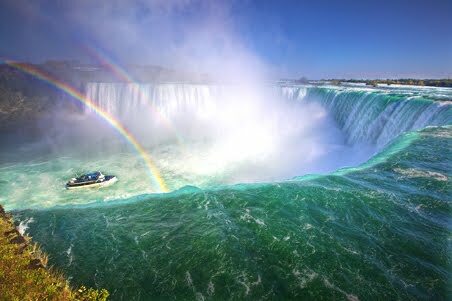 This pic is from Horseshoe Falls at Niagara. Very pretty. This pic is over the farmlands of the US. Almost makes me want to be a farmer....no. This was a produced rainbow from UC San Diego. But real or produced, it's still quite beautiful. Current Location: Shower, recycling, trash, etc, etc, etc. Busy! I needed something positive today, and what is more positive than a rainbow? Thanks for looking, I hope I helped to make your day wonderful also. Gorgeous! Thank you for sharing the beauty. Thanks for looking and enjoying. Hugs to Pip. I always have such fun finding beautiful pics to share with my f-list friends. Have a wonderful day. I love them too, so I'm delighted that you're happy to have some to look at this morning. I particularly liked the first one. I loved the first one. 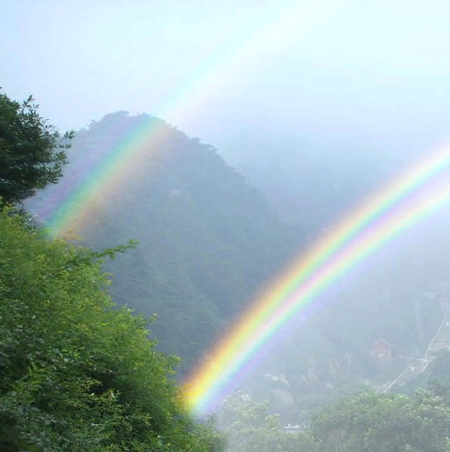 It was titled six rainbows in Norway. It took me a while (I don't think on razor's edges at 4am) to realize that the other three were the reflections in the water. HeadDesk. Apparently the University was examining the bending powers of light as demonstrated in a rainbow and made some. It was quite pretty. Apparently the University was examining the bending powers of light as demonstrated in a rainbow and made some. Rainbows are such a wonderful sign of hope and beauty. I always am amazed when I see one.